Care to guess where the new McLaren Tower is being built? For decades McLaren ran all of its activities out of the McLaren Technology Centre, its state-of-the-art headquarters in England. But it's been steadily expanding its footprint in recent years, and has now announced the construction of its largest facility outside of its home base in the otherwise sleepy town of Woking. The new McLaren Bahrain Tower was announced today in the wake of the Formula One grand prix held this weekend at the Bahrain International Circuit, which is precisely where it's being built. The British outfit expects construction to be completed by the end of next year. The tower will stretch eight stories tall and encompass some 86,000 square feet of floorspace. That'll make it bigger than any other McLaren facility outside of the McLaren Technology Centre and adjoining McLaren Production Centre (where it manufactures its exotic supercars). 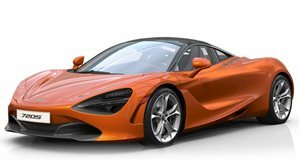 And that apparently includes the new McLaren Composites Technology Centre it recently opened in Sheffield, up in the north of England – to say nothing of all the dealerships and regional offices it's built around the world. The tower will serve as both a Brand Centre for the Middle East region as well as the head offices for the Middle East, Africa and Latin America division. So why Bahrain, you wonder? Well for starters, the Middle East – the Persian Gulf region especially – is a vital market for an exotic automaker like McLaren. The circuit at which the facility is being built is also a veritable mecca (if you'll pardon the reference) for motor racing, hosting not only Formula One but also the 6 Hours of Bahrain and a smattering of other races. But more than anything, we suspect, are the majority stake which the kingdom (through its Mumtalakat Holding Company) holds in the McLaren Group, and the board chair held by a senior member of the Bahraini royal family.